This gluten free chocolate chip cookie dough brownie cake is every cookie dough lover’s dream! Two layers of chocolate chip cookie dough are sandwiched between three layers of brownie cake. Drizzled with chocolate ganache and topped with a whipped chocolate ganache frosting, no one will believe this decadent layer cake is gluten free! This post is dedicated to my husband’s great love of chocolate chip cookie dough, something I discovered about Ben very early on when we first started dating. He’s the kind of person who will order chocolate chip cookie dough every single time we go out for ice cream, without fail. For our first Valentine’s day together, I made him cookie dough truffles dipped in chocolate and he loved them. Turns out cookie dough is the way to my man’s heart! So when I asked Ben what my next cake flavor should be, he responded, “cookie dough!”, without any hesitation, as if he’d just been waiting for me to ask. Then his eyes got really wide and he asked, “Wait, is that possible?! ?” And so the adventure began to create the perfect chocolate chip cookie dough layer cake. The thing is, a cookie dough cake was a bit of a conundrum for me because I can be a little crazy about food safety sometimes. Ben has zero qualms about sneaking a taste of raw batter or dough while I’m baking, but you won’t ever catch me doing the same. While making egg-less cookie dough isn’t too much of a challenge, I also knew I wanted to find a way to make it without raw flour, which the FDA warned against eating a few years ago. Admittedly, the risks of eating raw flour are pretty small, and everyone has to make their own decision about what makes them comfortable. But it was important to me to create a recipe I felt good about personally, and could also feel confident sharing with you. Therefore, the cookie dough in this cake recipe is made with very finely ground oat flour. I made my own by grinding old fashioned oats (make sure to look for certified gluten free oats if necessary) in a food processor. Then, I sifted the ground oats, which I found was really important to get a fine flour, close to the texture of normal wheat flour. Don’t skip this step!! Since I was already halfway to a gluten free cake with the edible cookie dough, I figured why not make the whole thing gluten free? If only to prove to you all that a gluten free cake can still be wonderfully indulgent! I’m telling you, nobody will guess this cake is gluten free if you don’t tell them. And so it was decided, gluten free brownie layers to sandwich the cookie dough layers – I mean, what better to pair with cookie dough than fudgy brownies? 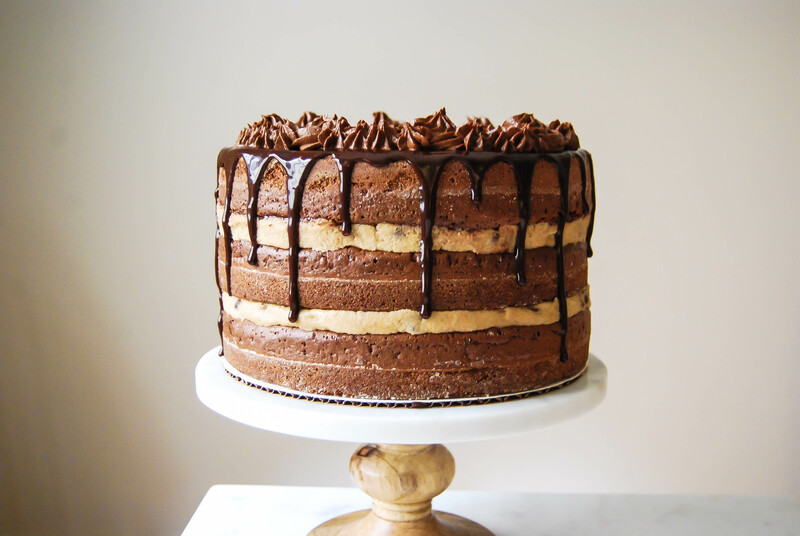 All five layers of the cake are stacked using a thin layer of chocolate ganache to hold them together. Then, I used the rest of the chocolate ganache to create a drip around the edge, and piped some stars and swirls with a whipped chocolate ganache frosting on top. Since the frosting isn’t needed to fill the cake, the recipe yields a very small batch of frosting. It’s also totally optional, but I promise you it’s a worthwhile addition! Besides, what’s cake without a little frosting?? Oh, and in case you were wondering, Ben totally gave this gluten free chocolate chip cookie dough brownie cake the stamp of approval. Despite not knowing if this cake was even possible, he claims “it’s everything I ever wanted in a cake”. I can pretty much guarantee your cookie dough-loving friends will love it too!! Preheat oven to 350 degrees Fahrenheit. Line the bottoms of three 8 inch cake pans with parchment paper, then butter and flour the pans (use gluten free flour or cocoa powder). Melt the chocolate chips using a double boiler, stirring frequently until smooth. Set aside and let cool slightly. Combine both sugars and oil together in another medium bowl, and whisk until well incorporated. Scrape down the sides of the bowl. Add vanilla extract and melted chocolate, whisking until smooth. Add dry ingredients to the wet, and stir with a spatula or wooden spoon until combined. Divide batter evenly among the three prepared pans and smooth the tops. Bake in preheated oven for 28-32 minutes, or until toothpick inserted into center comes out with only a few moist crumbs. Remove from oven and let cool in pans for about 15 minutes. Turn the brownie layers out onto a wire cooling rack and let cool completely. While the brownies are baking, cream butter and sugars in the bowl of a stand mixer until light and fluffy, about 3 minutes. Scrape down sides of bowl and add vanilla extract and salt. Beat until just combined. Add oat flour and mix on low speed until combined. Add milk, 1 tablespoon at a time, mixing well after each addition, until dough reaches preferred consistency. Fold in chocolate chips with a wooden spoon. Once brownie layers have cooled, place chocolate chips in a small heat proof bowl. Heat heavy cream and butter in a small saucepan over medium heat, stirring frequently, until butter is melted completely and mixture is heated through. Do not let the mixture boil, but you will see bubbles start to form at the edges when it's ready. Pour cream mixture over the chocolate chips and let stand for 5 minutes. Stir until smooth, and let cool for a few minutes. Place first brownie layer on a cake board, using a small amount of ganache to help it stick. Spread a thin layer of ganache on top of the brownie layer, using an offset spatula to spread it evenly. Working in small batches and using one half of the cookie dough, take handfuls of dough and press it into an even layer on top of the brownie. Spread a thin layer of ganache on top of the cookie dough, using an offset spatula to even it out. Stack the second brownie layer on top of the cookie dough and repeat steps 2-4, using the remaining cookie dough. Stack the remaining brownie layer on top of the cake. Using a spoon, carefully spoon the ganache around the edges of the cake, pushing it over the edges so that it falls in drips down the side. Work all the way around the edge of the cake before filling in the middle. Spoon or pour the ganache in the middle of the cake and carefully spread it outward so that it smooths together with your outer edge of ganache. Again, make sure you've reserved 2-3 tablespoons of ganache for the frosting. Put the cake in the fridge for about 20 minutes to let the ganache set. While the cake is chilling, make the frosting. Beat softened butter in the bowl of a stand mixer until light and fluffy. Gradually add cocoa powder and powdered sugar, beating on low speed until combined. Scrape down sides of the bowl and add vanilla extract and the reserved two tablespoons of chocolate ganache. Beat until combined. Add more ganache or powdered sugar to achieve your desired consistency, then turn mixer onto high speed and whip until smooth. Once cake is chilled, pipe frosting on to cake as desired using a piping bag and tip. I used a large open star tip to create swirls and stars. *I recommend grinding about 4 cups of old fashioned or traditional oats in the bowl of your food processor until the mixture is very fine. Then, sift the oat flour using a mesh sieve or flour sifter. Measure out 3 cups of the oat flour to use in the cookie dough and reserve the larger, grainier particles for another use (muffins, energy bites, etc). **If ganache has thickened too much to create a nice drip around the edges, reheat it briefly in the microwave and stir it until smooth. You are looking for a consistency that drips fluidly, but slowly off a spoon. You don't want it to be runny (otherwise, it will slide off the cake and pool at the bottom), but not too thick either (otherwise, it will barely drip at all). Inspired by Lindsay at Life, Love, and Sugar. This seems like something I would eat any time of the day!!! Can I use my regular flour to make this cake? Though that recipe only makes two layers (but you could make an extra half a recipe to get three layers). You don’t make reference to HOW MANY chocolate chips in the ingredient list for the chocolate chip cookie dough batter. Oh no, so sorry Monika! How could I forget the chocolate?? I’ve just updated the recipe with the amount of chocolate chips for the batter – I used 1 cup of semisweet chips. Thanks for letting me know.